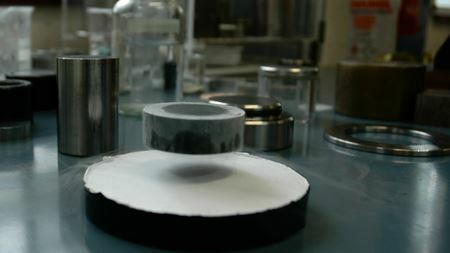 Single grain Gd-Ba-Cu-O superconductor samples clamped together in a shrink-wrap steel ring. Nanocrytsalline titanium dioxide is a promising material for the next generation of “smart windows”, according to new results from researchers in India. Scientists have created a one-step process for producing highly efficient materials that let the maximum amount of sunlight reach a solar cell. A large international team shows that the electronic properties of graphene change dramatically. Seeing through opaque surfaces without exposure to x-rays. The first practical polariton laser? Straddling the worlds of light and matter.